Hello, thanks for stopping by! 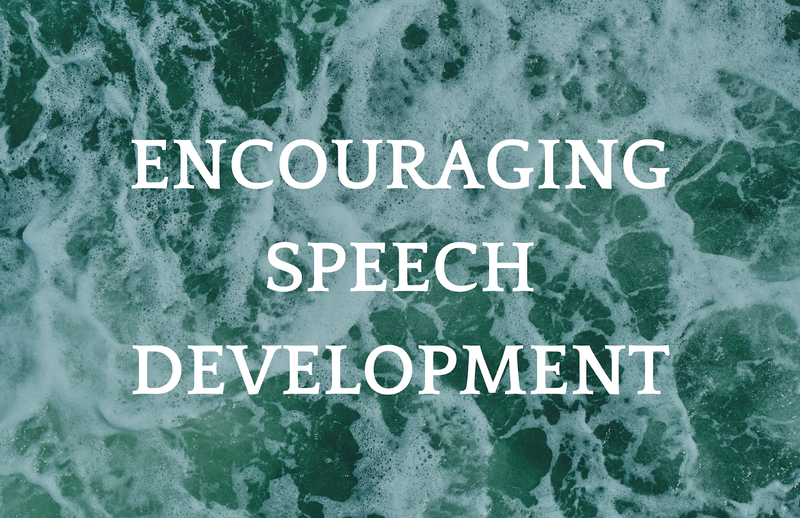 I am here today to share with you some tips and tricks on how to encourage speech development in children. These ideas worked wonders for us, and my son started speaking at only a few months of age. Please remember that all children develop slightly differently. Some will start speaking earlier, some later, so don't be too hard on yourself and your child. However, if you are concerned that your child may be speech delayed, it is best to check it with the specialists. Reading develops language, imagination, creativity and intelligence. The sooner we start reading to our child, the better. The long hours spent on breastfeeding when Kian was tiny were a fantastic opportunity for me to read aloud to him. When I was bored with baby books, I would read kids books to him (like Roald Dahl's 'Matilda'). When he was 3-4months old, and his grasp was good enough, he used to grab the soft, fabric books and 'read' them in his own language. Up until Kian turned 1.5 years old, we would read for around 2h a day. It was one of his favourite activities, and it still is until today. If your child isn't interested in books right away, do not give up. It is totally normal. Turning the pages, chewing on books instead of listening, or only being able to listen to half of the book is normal, too. Reading 5 minutes a day makes 30 hours a year. That is a lot! Trust me- your effort will pay off. I know that when the little alien suddenly appears in your house, it may feel awkward speaking to him. For most parents, it takes some time to feel comfortable when talking to their baby. I remember not even being sure what to say. Even if talking to your baby feels awkward, just talk. Minute after minute, day after day it will get easier. You can start by describing the room you are in, the toys that you're holding, the weather, your feelings and emotions. Singing to your child would be perfect, too. When you speak, your voice calms your baby, and you're exposing him to many words and grammar structures. You are your child's first teacher, and the more you talk to him, the more he talks. It is important to engage in conversation with your child. No matter if they use their body language to communicate with you, or they're already verbal- get engaged. Answer their questions, acknowledge that they're trying to tell you something. If, for instance, they're pointing at the sleeping cat, you may say- 'Yes, our cat is sleeping'. Let your child know that they are important to you, that they have a voice, that they can communicate their feelings, that nobody ignores them. This boosts their confidence, and the more they are understood, the more they want to communicate. The labour is an exhausting experience not only for the mother but also for her baby, who spent 9 months in a cosy, warm and dark womb. Right after birth, babies experience seeing so many different faces, furniture pieces, toys, paintings, posters, so many colours, so many textures, so many shapes. Toss in the sounds and smells. It is overwhelming, so if you add a TV in the background, it may feel like going to a techno party with a severe migraine. The brain of a newborn cannot deal with all the flashing lights and obtrusive sounds. Watching screens before the age of 2 can delay speech, cause attention issues, and has a detrimental effect on short term memory and reading skills. And yes, I know that babies who are regularly watching TV or any other screens will eventually learn to speak. Some of them may even start to talk very early. But what I need to point out is that children learn all the time. This means that whether you intend to teach them something or not, they absorbe everything they see and hear. The time spent in front of the TV is a time cut on exploring the world, interacting with people, and bonding with nature. With the noise in the background, we usually talk less to our children. The less they hear, the less they speak. Also- whatever we surround our children with becomes a part of their beings forever. If we expose them to the TV shows with aggressive language, sexist music videos, frightening video games- they will absorb it just as much as watching the flowers and birds in the park. Kids don't understand that what they see on TV (even the adverts) isn't real life. Even passive watching is still watching. Whilst exploring the world and absorbing so much of it every day your child will develop his own interests. It is easy to spot them when you mindfully observe your children, and it is best to set up activities based on them. This will give you an opportunity to expose your child to new vocabulary, and because it will be related to his interest, he will more likely want to learn it. New words will be a tool that he could use to express himself, and the more tools he has, the more independent he becomes. Kids learn best when they are in the flow state, and in order to be in the flow state, they need to concentrate. It is much easier to concentrate on learning in a peaceful and calm environment- quiet, clutter-free, inviting and fun. I would suggest downsizing the toy collection, or at least rotating them, so your child won't feel overwhelmed and overstimulated by unnecessary stuff. Your baby needs a good sleep just as much as you do. A good equals safe -without unnecessary clutter in his bed; in a ventilated, tranquil bedroom. Also, the way we fall asleep and wakeup is extremely important. It scares me that the Cry It Out method is still very popular, being promoted by some parents and authors. This is a cruel method of sleep training babies that elevates the cortisol, which leads to loneliness, depression and anxiety, and it slows down the brain development process. One of the best ways to boost your child's confidence is to let them be as independent as possible. Allow your child to make choices, to help to prepare his meals, to select what he wants to wear. A confident child will express himself better. We are all born with a natural desire to learn, discover and make progress. Every child has the great potential to live a happy and successful life, and every child will if only his parents give him the right tools. Confidence and independence are the core of happiness. I know that the vision of a baby eating a larger piece of food rather than puree may be a little bit scary for some parents, but this weaning method allows your child to explore different textures, colours, smell and look of the food items. It allows him to eat at his own pace, it gives him confidence, because he realises that he can make things happen. He will start chewing earlier, and chewing is a fantastic mouth exercise that improves articulation. Furthermore, we learn through senses, so we have to stimulate them. As I have mentioned before, it is important to stimulate the child's senses. You can do it easily by creating various sensory play activities- bins filled with tissue paper/ kinetic sand/ scarves/ sand/ pebbles/ water/ water beads/ artificial grass/ soapy water and some scooping tools, or little figurines; you can make a light table, squishy bags, finger paint, sensory sound bottles, water xylophone. To help your child explore the sense of smell you can make smelling bottles, scented playdough, or let them actively take part in preparing meals. The list of activities is endless. Fine motor skills development and speech development are closely linked. The better the child's hands work, the better is their speech. To support the development of fine motor skills you can set up some activities for your child. For babies, it is important to practice grasping, transferring objects from one hand to another, dropping and picking up objects etc. They can be pulling scarves from the box, banging two small toys together, ripping the paper, grabbing the pom-poms out of a whisk, putting items into boxes (and taking them out). Toddlers will learn how to feed themselves using cutlery, build small towers, string large bids, scribble, fold the paper in half and many more. So using stamps, playing with playdough, threading beads onto pipe cleaners, making pasta necklaces, whisking soapy water, painting with fingers/ hands/ brushes/ flower heads/ leaves, playing with stickers, drawing and all similar activities will strengthen their hands and support the speech development. These sweet conversations are very encouraging for babies. When your baby makes a sound, try to imitate it and say it back to them. However, I would suggest cutting back on the 'baby talk', because babies understand the words way before they can say them, so it is important to pronounce them clearly. I know that breastfeeding is a controversial topic, so I just want to ensure you that I do not shame women who formula-feed their kids, because a) their body- their choice; b) breastfeeding can be difficult at the beginning, most of the times there is no one there for a woman to provide help and support with it; c) some women can not breastfeed; d) some children have no mums, or they have foster parents, or they are growing up in a family with two dads. Breastfeeding, however, is great for both mother and a baby, How is it related to speech development, though? Breastfed children have a different pattern of sucking than bottle-fed children, and breastfeeding improves the coordination of lips, mouth, tongue and jaw muscles. When Kian was born, he was on the breast for around 20h a day. It was tough. As it seemed unusual to the people around me, they were suggesting to start giving him a pacifier. After a few weeks, desperately wanting to pee in peace, I decided to give it a go. Today I have to say that I am grateful that he has never accepted it, and only tried it a few times (I wore braces because my teeth were awfully crooked, so I wanted to avoid my baby having to go through that). When babies have dummies in their mouth, they don't really feel the need to copy the sounds, babble and eventually talk. I am not trying to say that a baby who uses dummy won't speak, or they will be diagnosed with speech delay, but there is a possibility that they may. Some simple oral motor exercises like blowing small objects (tissues, cotton balls etc.) will strengthen your child's tongue. For more ideas for advanced activities, I would suggest reaching out to a specialist. Great advice. They all talk in their own time and the best thing is to not compare to other children! I am working on cutting back on screen time with my son. He wants to watch tv or play with an ipad all the time. Thanks for sharing your advice. I love those first words so precious. My son has just turned three now and we have such good conversations. I’ve always listened to what he has to say and love how he sees the world.